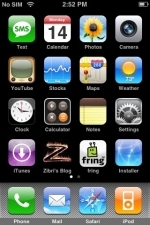 Fring launched today a VoIP app for iPhone that allows iPhone users to make VoIp calls. Fring supports Skype, MSN messenger, GTalk, ICQ, SIP, Twitter, Yahoo Messenger and AIM. To use Fring you need jailbroken iPhone and a good Wi-Fi connection. This is pre release of the app and final full-feature release will come later incorporating feedback from the users. your fring works very good on wifi, but can it works for bigger range but not just wifi ?